The iRTU S & iGW S series products combine the excellent performance of the iRTU & iGW units and state-of-the-art switch technology. This provides a modular, flexible, and economical solution for bay controlling. The S series is the perfect choice for rugged applications in substations conforming to IEC61850. As IEC61850 clients they will be able to collect data from the new IEC61850 bay IEDs and report this information (along with the data collected from the other bay IEDs) to the Control Center/s using most standard protocols (e.g. IEC60870-5-104). They can also act as substation gateways (IEC61850 servers), mapping the old serial IEDs to IEC61850 logical nodes. 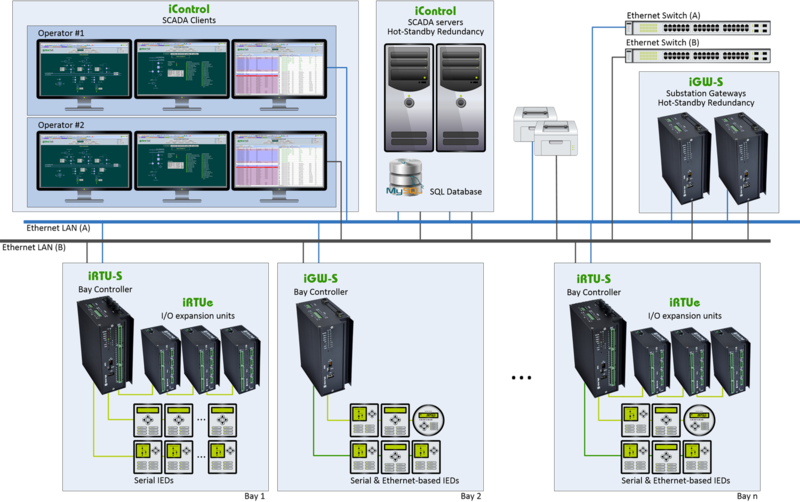 An architecture based on iRTU/iGW S units scattered through a substation and connected to an Ethernet network offers a scalable and open system that will facilitate the integration of new generations of devices (IEDs, sensors, routers, etc. ), as well as the adaptation to customers’ current and future needs, network topology, and communication media. The iRTU S & iGW S series products integrate switch capabilities in the same enclosure as the iRTU/iGW telecontrol units, thereby allowing the reduction of overall deployment and maintenance costs of the system. Internally the RTU and switch modules are designed to work as independent devices. Therefore, the switch operation will not be affected by a failure in the remote telecontrol module (for example, due to a configuration error of the RTU database), and vice versa. – (1) EXP422 port (RS422/485 software configurable), for connection to iRTUe I/O expansion units, or to other devices. The iRTU-S0 & iGW-S0 series products combine the excellent performance of the iRTU/iGW units and the high functionalities of an external switch. 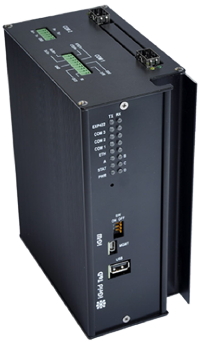 The iRTU-S0 series integrates both serial and Ethernet communications with direct I/O acquisition in just one device. They can act as bay controllers concentrating all the information either coming from old bay IEDs that only support serial communication and new bay IEDs supporting Ethernet-based communication, or coming from direct data acquisition of their internal I/O modules. The iGW-S0 units provide the same communication capabilities than the iRTU-S0 units, but with no internal I/O modules. Each S0 module offers two redundant Ethernet ports (100BaseFX fiber or 10/100BaseTX copper ports), three Ethernet 10/100BaseTX ports, and three serial ports (two RS422/RS485 and one RS232/RS422/RS485). From the Ethernet point of view, the internal managed switch includes features such as virtual LANs, QoS, and redundancy mechanisms like PRP (Parallel Redundancy Protocol) and HSR (High-availability Seamless Redundancy) in order to significantly increase the availability and reliability of the network. In addition to these features, one can also find accurate clock synchronization compliant to the IEEE 1588 standard version 2.0. Those features meet security requirements of IEEE 1686 and IEC 62351 and help achieve NERC CIP cyber security compliance. iRTU/iGW-S3 units offer four Ethernet ports, and four serial ports (three RS422/RS485 and one RS232/RS422/RS485, software configurable). iRTU-S3 units also offer direct I/O acquisition in the same device.The internal switch supports IEEE 802.1d RSTP (Rapid Spanning Tree Protocol) redundancy mechanism. The iRTU & iGW series products include the most widely used communication protocols at the electrical facilities, both through serial ports and Ethernet. (1) EXP422 port (RS422/485 software configurable), for connection to iRTUe I/O expansion units, or to other devices. iRTU-S0 and iRTU-S3 units include internal I/O modules. Basic models (iRTU-S0D1 and iRTU-S3D1) are equipped with D1 I/O card (24 digital inputs module). Other options upon request. Power supply options: 24Vdc, 48 Vdc or 125Vdc (–15% +20%). Contact iGrid T&D for other power supply options. iConf tool for configuration and management of iRTU/iGW units.